The Vita-Prep just got Juiced! 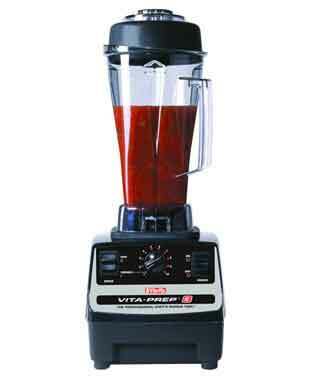 The new Vita-Prep 3 has more power to handle the thickest, toughest ingredients! Grind meats for p�te or chop tough vegetables for authentic Mexican salsa without overheating! Use the variable speed for perfect pur�es, savory soups and delicious frozen treats. The Vita-Prep 3 is a must in kitchens where volume and quality are key ingredients to a successful back-of-the-house. More power, larger cooling fan, Vita-Mix quality...a great recipe has been perfected! FAST! A workhorse in the commercial kitchen, pur�eing quicker and smoother than any blender or food processor you have ever used without over heating. CREATE! Includes a 54-page recipe manual that explains methods, variations and suggestions for a myriad of menu items. PROFIT! Easy-to-prepare pur�es or chopped vegetables cost less to make than fabricated products.